I recently attended a homeschool convention. I had a wonderful time and learned about many amazing resources. However, there were a few vendor faux pas that I feel I should mention. When you send a person or a group as your representative, please be mindful of the homeschool mom and her needs. If you send reps who are dressed in nice black business suits and who are mostly men the age of my grandfather, I will feel intimidated. I might not stop by your booth because I’ll be worried that they won’t be able to relate to me and my needs. I’ll also wonder just how much experience they have homeschooling with your products. If your enthusiastic rep traps me when I walk by and won’t let me leave, I won’t be excited to learn more about your product. If I’m inundated with a very long spiel and an endless barrage of questions with no chance to respond I will be sure to avoid your booth in the future. And if your rep is practically yelling at everyone who passes by, I will refuse to make eye contact as I scurry by. If your rep is sitting quietly behind a table then you can be sure that I won’t make a stop. I’m looking for someone who looks ready to talk to me and who looks excited to share about their products. And if your rep is reading a book or looking at a computer, I will certainly breeze right past you. If your booth has no visuals, then I probably will pass right by. I’m wandering a huge vendor hall with hundreds of options and your booth does not catch my eye. If I can’t easily identify who you are or what your product is, I might not take the time to find out more when I’m trying to fit in shopping and speaker sessions. Those were a few of the things I observed at my most recent convention. I‘m a homeschool mom at a convention; I’m overwhelmed, slightly intimidated, and I’m feeling a little lost. I’m on the lookout for booths that catch my eye, reps who look approachable and cheerful, and products to support my homeschool. 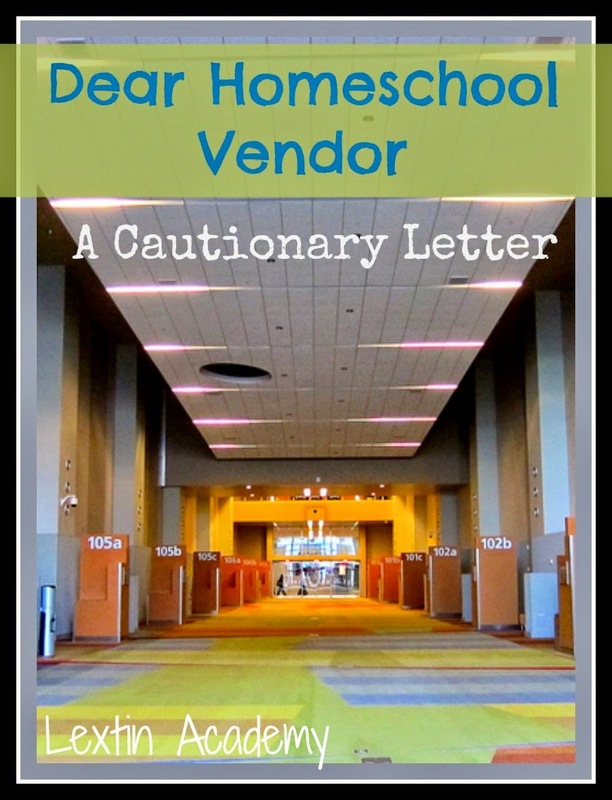 Watch for my next post in which I write about what vendors can do to help a homeschool mom at a convention. Very good points, Lexi! I always wanted a rep who wanted to explain their products, not sell them! The good products sell themselves! It's so true. I don't enjoy hearing a flashy sales pitch. I like to talk to people who have used the program or people who seem to be somewhat like me. I just like being able to ask my questions and get solid answers and not feel overwhelmed.